This map, reproduced from Michael Wood's book In Search of Shakespeare, shows a number of places which played a role in Shakespeare's background. 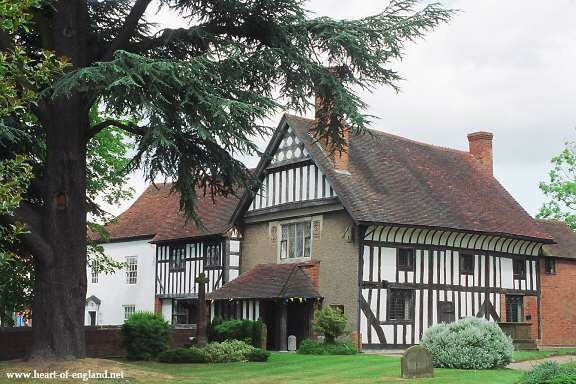 The Shakespeare family originated in Balsall, and from there spread to the adjacent villages of Wroxall, Knowle, Packwood and Rowington, and in the next generation to Snitterfield. Packwood, Baddesley Clinton and Lapworth, near to these villages, were homes of important Catholic families close to the Shakespeares and the Ardens. An accompanying TV series has been shown on BBC/PBS. "The search for Shakespeare starts not in Stratford but a short way to the North in a tiny cluster of villages in the Forest of Arden. 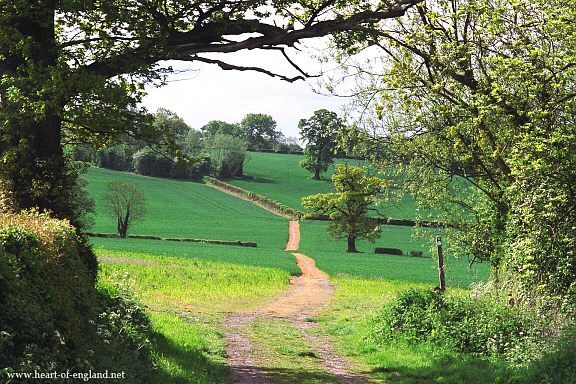 In the 16th century it was still a vast tract of forest, part of what the Normans called "beautiful wild country", and a completely different world from the crowded streets of London. Unlike the works of most of his university-educated contemporaries, Shakepeare's plays are full of images of flowers, trees and animals. This was a place to fire the imagination...". 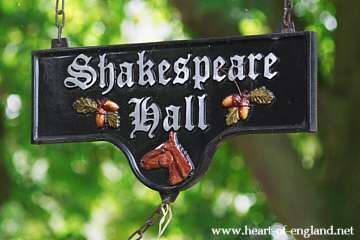 For several generations Shakespeare's ancestors, on both his father's and mother's sides, had been Warwickshire farmers. The river Avon (shown on the map above) divided Warwickshire into 2 halves. The North-West half was the old Forest of Arden. 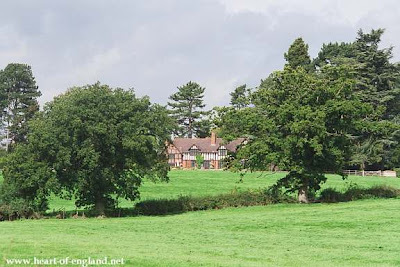 Shakespeare's ancestors all farmed holdings, of around 100 acres each, all in the Forest of Arden. The Shakepeare family name originated in Balsall in the 14th Century. This picture shows present day farmland at Balsall. This picture is taken looking towards Green Lane which runs left-to-right behind the trees along the top of the hill. 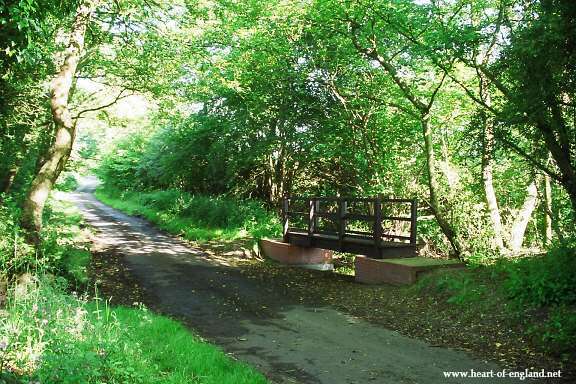 The picture is taken from the Heart of England Way, a recreational footpath. 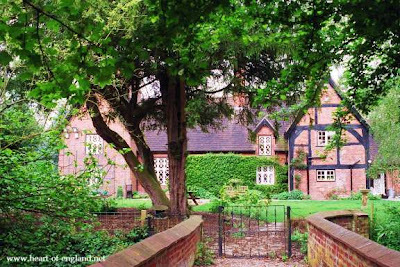 "The Shakespeares' ancestors came from around the village of Balsall with its old chapel and hall of the Knights Templars. Down Green Lane, shrouded by thickets of ash and silver birch, across a ford that runs deep in Winter there is still a red-brick farm house where Adam of Oldeditch lived in the 14th Century. His son gave himself the surname Shakespeare. There were still Shakespeares at Oldeditch 100 years later, and almost certainly the clan descended from them". This is a view along Green Lane, showing the ford referred to by Michael Wood. About 200 yards from the ford is the present Oldeditch Farm House. This is the view from a field at the rear of Oldeditch farm house. 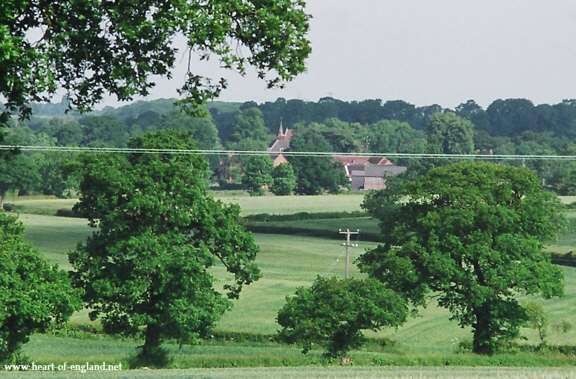 The group of buildings in the centre of the picture is the hall and chapel of the Knights Templar at Balsall, referred to by Michael Wood. These buildings are shown in close-up in the picture below. The white lines running across the picture are power cables. 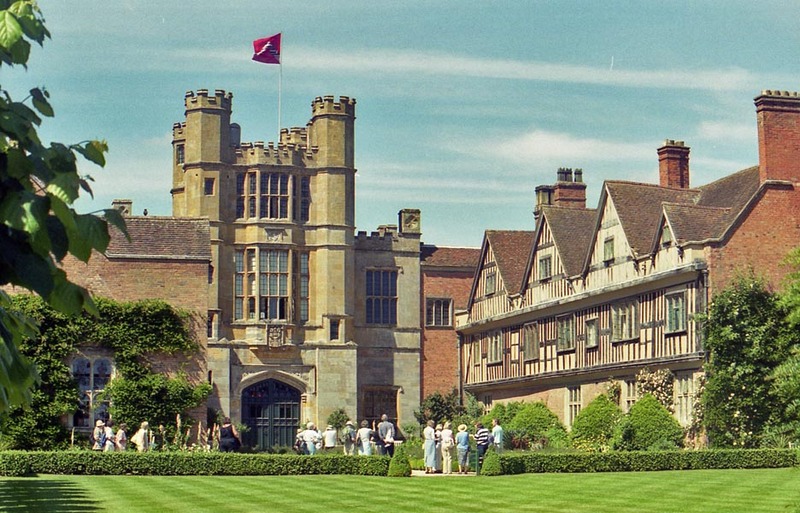 This picture shows the Shakespeare family's home, Shakespeare Hall, at Rowington. This picture shows the remains of a Benedictine Priory at Wroxall. 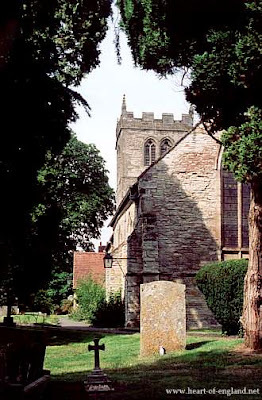 Richard Shakespeare (grandfather of Willimam Shakespeare) was born in Wroxall, c1500 (not at the Abbey). 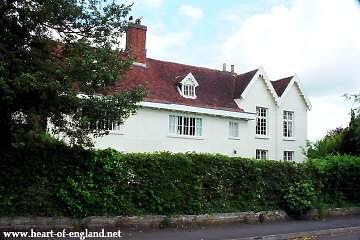 He moved from Wroxall to farm in Snitterfield (see further below). 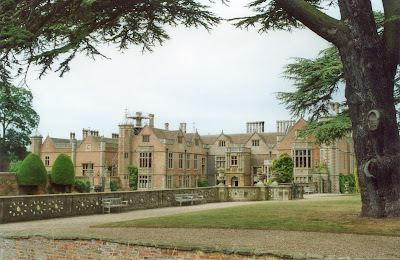 This is the moated manor house Packwood Hall, at Packwood. 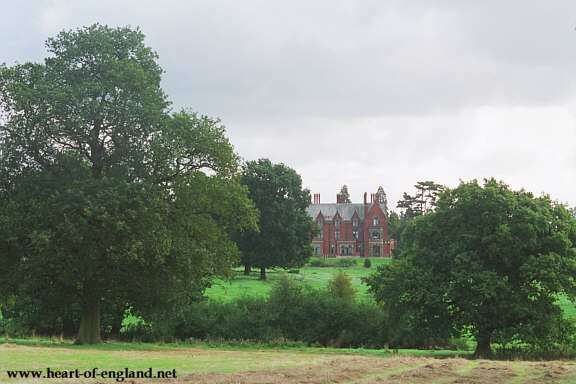 The Shakespeares of Packwood were business partners of Shakespeare's father, John Shakespeare. The historian Raphael Holinshed lived at nearby Packwood House. He was the author of the Chronicles of England, that were the primary source for Shakespeare's history plays. Michael Wood wonders whether William, as a youth, might have known Holinshed in person. 2 miles from Balsall was the village of Knowle, today a small town. This picture shows the Guild House, which dates from 1412. 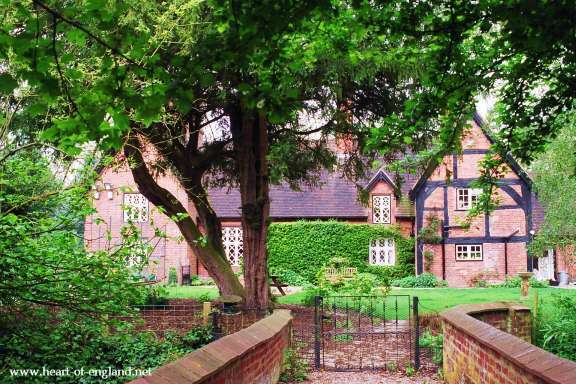 Thomas Shakespeare of Balsall, became a member of the Guild here in 1486. Michael Wood also lists the members of the Guild here in 1526, which effectively names the principal figures in Arden Society (more about the Knowle Guild members further down this page). 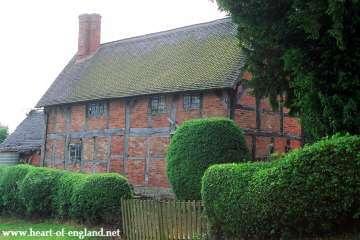 Richard Shakespeare (born in Wroxall, c1500) left Wroxall to farm leased land in Bell Lane, Snitterfield (2 miles North-East of Stratford). Richard Shakespeare farmed here for 35 years. 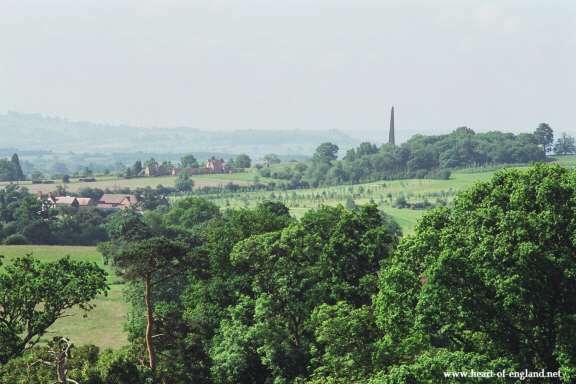 This picture, taken from the bottom of Bell Lane, shows farmland around Snitterfield Church. 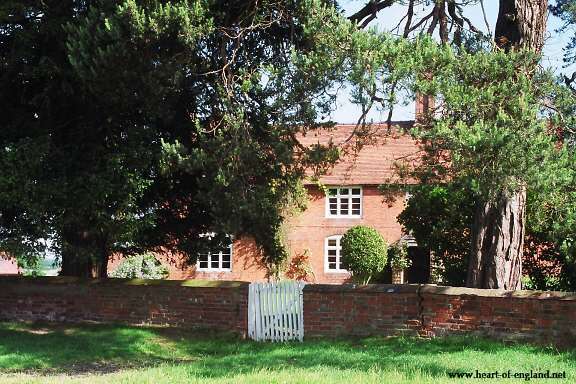 This picture shows the farmhouse originally occupied by Richard Shakespeare. One of Richard's sons, John Shakespeare, became the father of William Shakespeare. It is likely that young William Shakespeare would have been a frequent visitor to this place. The house has been substantially changed, but does retain some tudor features. 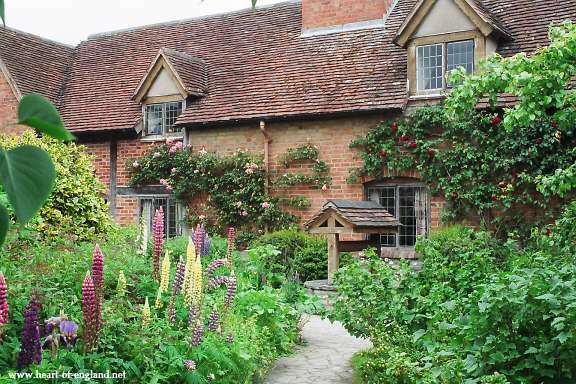 Just down the road is an authentic half-timbered farm building, used by the Shakespeares. Snitterfield is within easy walking distance of Stratford. There are good views from Snitterfield. This picture shows the view looking from Snitterfield towards Stratford. You can't actually see Stratford, because it is hidden behind the Welcombe Hills (the groups of trees around the obelisk at the right). The Welcombe Obelisk looks down over Stratford. The is the church of St James The Great at Snitterfield. 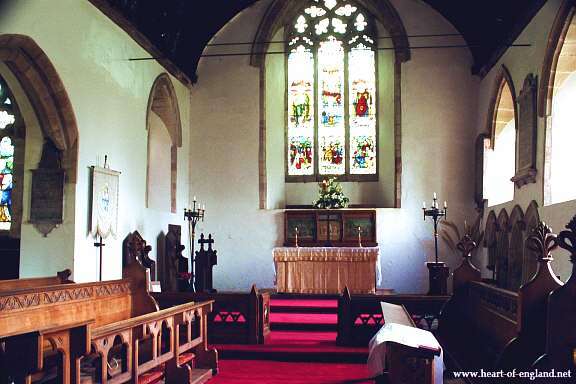 On display in Snitterfield Church are copies of parish records referring to members of the Shakespeare family. 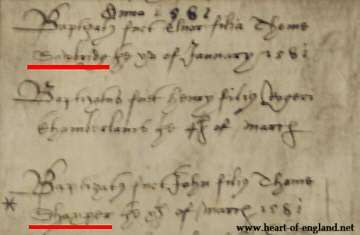 The names in those shown here (dated 1581) are spelt Saxper and Shaksper. 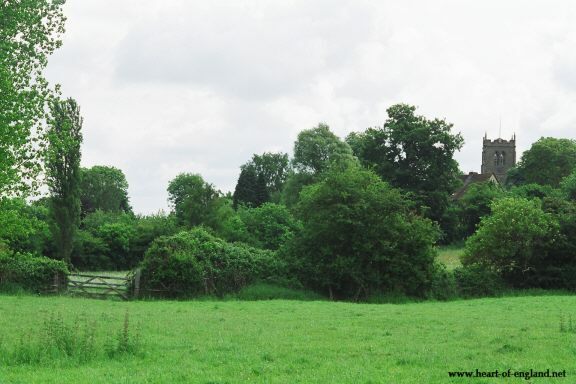 The land in Snitterfield which Richard Shakespeare farmed was owned by the Arden Family from Wilmcote, another old Warwickshire family of yeoman farmers. This picture shows the Arden's farmhouse at Wilmcote, now known as Mary Arden's House. One of Richard's sons, John Shakespeare, who grew up at the Snitterfield farm, met one of the daughters of the Arden family, Mary Arden. 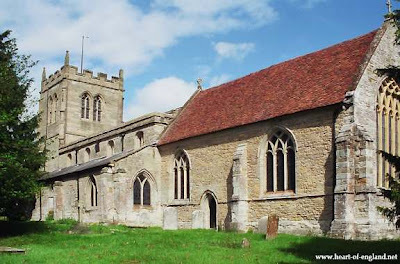 John Shakespeare married Mary Arden in Aston Cantlow church, which was the parish church for Wilmcote, the bride's home. 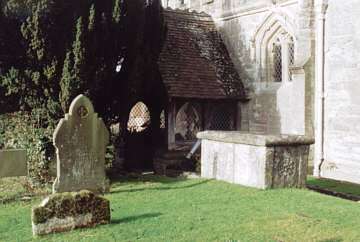 This picture shows old tombstones, old yew trees, and old pines in the churchyard of St John the Baptist at Aston Cantlow. The interior of Aston Cantlow church is shown in the picture just below. 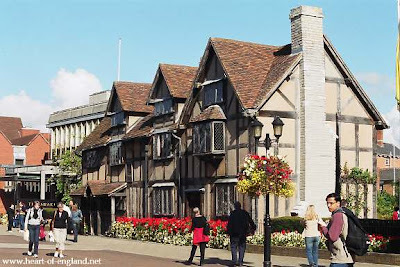 John and Mary Shakespeare went to live in a house in Henley Street, in Stratford (the Shakespeare birthplace), which is where their son, William Shakespeare, was born. 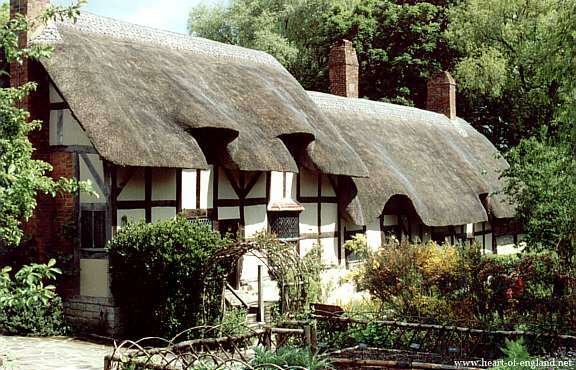 A mile from the centre of Stratford, and on the edge of the Forest of Arden, was the village of Shottery, and the home of Anne Hathaway, who became Shakespeare's wife. 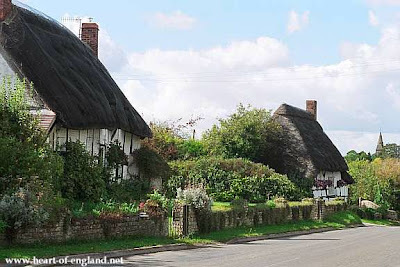 William Shakespeare and Anne Hathaway were married at Temple Grafton, another village connected with with the Knights Templar. It is believed that Shakespeare and Anne Hathaway were married here, and not in Stratford, because the priest here, John Frith, was sympathetic towards a Catholic form of service, which was not available in Stratford. Shakespeare's childhood was a time of intense religious conflict between Catholics and Protestants. The Shakespeare and Arden families both had stong Catholic sympathies. The whole Forest of Arden was an area of Catholic support. Also shown on Michael Wood's map are Lapworth and Baddesley Clinton. 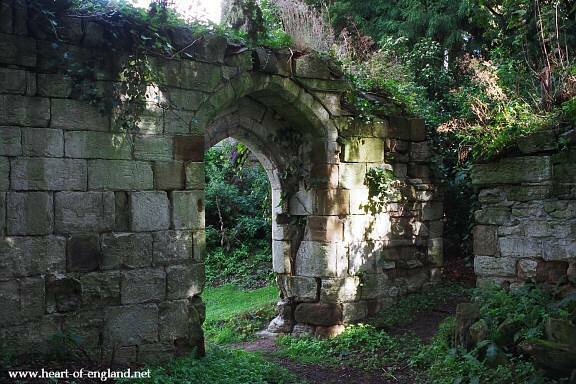 These places were the homes of important Catholic families, close to the Ardens, and the Shakespeares. These families were at the centre of plots to attempt to overthrow the Protestant Crown, and were themselves the focus of Protestant persecution. This picture, taken in Lapworth Churchyard, shows the table-top tomb of Robert Catesby, principal conspirator behind the Catholic inspired Gunpowder Plot, to blow up Parliament and the Crown. 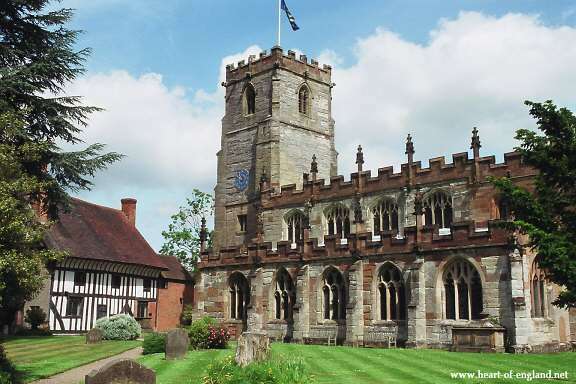 There are more pictures of Lapworth Church and the countryside around Lapworth on the Lapworth Page. Another important family of Warwickshire Catholics involved in the Gunpowder Plot were the Throgmorton's of Coughton (not on Micheal Wood's map), but also a few miles North-West of Stratford. In the South-East corner of Michael Wood's map, and on the other side of the Avon, is Charlecote. Definitely on the wrong side of the river. Shakespeare ridiculed Sir Thomas Lucy of Charlecote as his Justice Shallow in Merry Wives of Windsor, and Henry IV part 2. The traditional explanation has been that Thomas Lucy caught Shakespeare poaching deer. In fact, there were no deer at Charlecote then. Micheal Wood explains that Shakespeare's animosity towards Thomas Lucy was far more likely due to Thomas Lucy's role in the persecution of Warwickshire Catholics, and particularly his role in the arrest of Edward Arden, head of Shakespeare's mother's family, who was taken to London, tortured and executed.